In addition to offering a fantastic combination of grand historical monuments, vibrant cities, & world-class cuisine, Spain represents one of the largest & most popular job markets for teaching English in Europe. TEFL TESOL Certification is required and students can obtain certification at our Madrid Spain TEFL Course, Barcelona Spain TEFL Course or any of our other Worldwide TEFL TESOL locations or by taking the Online TEFL Class. Interview in person in Spain & begin teaching as soon as you get a job. Applicants for Government program will apply in advance from home in Spring for positions beginning in Aug/Sept. Some schools may sponsor a work visa for non-European Union citizens (this is extremely rare); the government program will sponsor visas for non-European Union citizens; EU citizens can typically work legally in Spain. Most Americans & other non-EU citizens without a work visa "under the table." in private schools & as private tutors. Some will also teach on a student visa.Learn more about our Spain Student Visa Program. Canadians & some other non-Europeans (though not currently Americans) may be able to work on a Working Holiday Visa. Spain is one of the most popular locations in Europe and the world for teaching English abroad. English teachers in Spain typically find work in September or early October, and then again in January. Most contracts to teach English in Spain end in late June. For those looking to teach English in Spain through the summer, opportunities at summer English language camps are available in Spain and throughout Europe. Summer camp positions typically start in late June and early July. English teachers in Spain will be expected to interview in person once they arrive in Spain, and they will also be responsible for their airfare and housing. Many English teachers in Spain live in apartments recently vacated by previous teachers, and many share a flat with their coworkers. 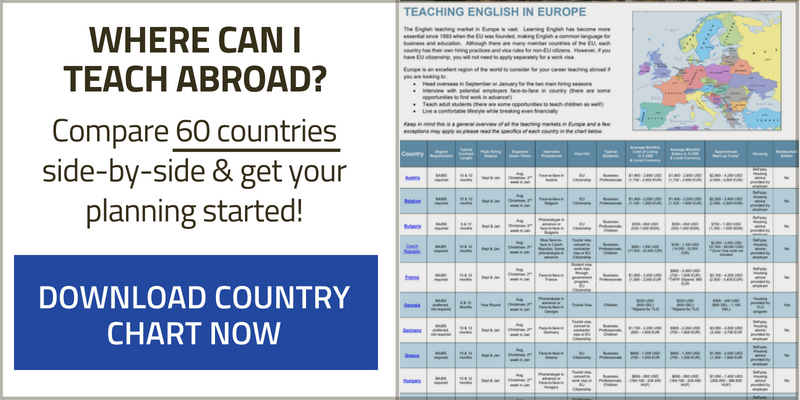 For a full run-down on getting a teaching job in Spain, read What You Need to Know Before Moving to Get a Job Teaching English in Spain [The Ultimate Super Cheatsheet]. The process will be different for those who teach through the Cultural Ambassadors Program, which is a government program that recruits and places Americans and Canadians in public grade schools and high schools through Spain. To learn more, please read What is the Cultural Ambassadors Program for Teaching English Abroad in Spain? 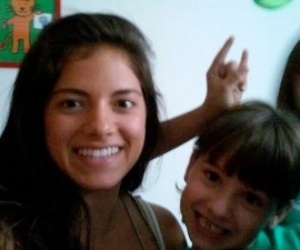 Check Out Stories & Videos from Alumni Teaching in Spain! A solid hourly wage enables English teachers in Spain to live a comfortable and enjoyable lifestyle. Schools in Spain typically offer 20-25 hours per week of work, leaving you plenty of opportunities to travel and explore. Please note that while a bachelor's degree is not required to secure a job in this country, it can still be strongly preferred by employers. If you do not have a degree, you should be prepared for a more competitive job search. Major cities for English teaching jobs in Spain are Madrid, Barcelona, Seville, and Valencia. *Note about the Job Market for Americans in Spain: Spain represents one of the stronger job markets in Europe. It is important to note, however, the vast majority of non-EU citizens, including Americans & Canadians, enter and teach English in Spain on a tourist visa. While not legal, it is the common practice. To learn more, please speak to an ITA advisor & read the following article: Teaching English abroad “Under the Table” Without a Work Visa - What Does it Mean?. check out our Spain Resource Hub. Want More Information about Teaching English in Spain? The market for private English lessons throughout Spain is immense. Private tutoring does offer some advantages. Teachers are typically paid more per hour, and it offers more control over your schedule. Potential challenges include building a roster of regular students and dealing with students that don't show for lessons. NOTE: Most Americans teaching in Barcelona work as private tutors & independent contractors on an expired tourist visa, which is not legal, but is extremely common. To learn more about how it works, please read: Visas & Jobs: A Quick Guide to Teaching English in Barcelona, Spain for Americans. Also, read this article from Lauren O'Rourke, a Chicago native who has been teaching English in Barcelona for 2+ years: How to Find Private English Teaching Work in Barcelona, Spain. Citizens of European Union nations do not typically need a visa to teach in Spain. Some foreign English teachers teach on a student visa or a working holiday visa, however, the vast majority of non-EU citizens, including Americans enter and teach Spain on a tourist visa. While not legal, it is the common practice. International TEFL Academy does offer a Student Visa Program in Madrid that enables ITA students from all ITA TEFL Classes who are US & other non-EU citizens (who meet certain requirements) to study Spanish & work legally in Spain teaching English full-time on a student visa. To learn more, please speak to an ITA advisor & read the following articles: Teaching English abroad “Under the Table” Without a Work Visa - What Does it Mean? & How to apply for a Student Visa to legally teach English in Spain. We also recommend reading Alumni Q&As for firsthand perspectives on visas and other facets of teaching in Spain. North American Language and Culture Assistants in Spain. Each year, the Spanish Ministry of Education recruits more than 1,000 Americans & Canadians to work as assistant language teachers in elementary schools. Advantages include the ability to line up a job in advance and receive a visa. The drawbacks are that you don't pick your assignment and pay is considerably lower than in the private sector. Knowledge of Spanish is required. To Learn more, read What is the Cultural Ambassadors Program for Teaching English Abroad in Spain? How Can We Help You Teach English in Spain?